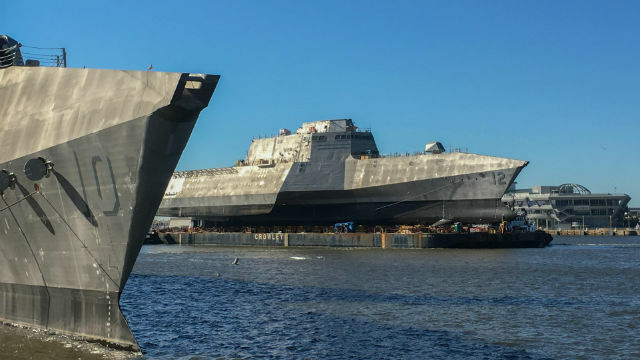 The next two Independence-variant littoral combat ships bound for San Diego will be named after the South Texas city of Kingsville and the capital of South Dakota, Pierre. The future USS Kingsville, designated LCS 36, will be the first ship to bear the name. It honors both the city and Naval Air Station Kingsville. “”The citizens of Kingsville have been steadfast partners to the Navy and Marine Corps team and their enduring support of our future strike fighter pilots have helped make the city of Kingsville the gateway for naval aviators,” said Navy Secretary Richard V. Spencer in making the announcement on Monday. A day later he announced USS Pierre as the name of LCS 38. It will be the second Navy ship to bear that name. “The citizens of Pierre and the entire state of South Dakota have a great history of service in the Navy and Marine Corps team, and that legacy will live on in the future USS Pierre,” Spencer said. The 419-foot-long warships will be built by Austal USA in Mobile, AL. The Navy has accepted delivery of 17 littoral combat ships in two variants with 18 more ships under construction or on order. The futuristic, trimaran-hull Independence variants are based in San Diego, while the more traditional monohull Freedom variants operate on the East Coast. The LCS is a highly maneuverable, lethal and adaptable ship designed to support mine countermeasures, anti-submarine warfare, and surface warfare missions in the world’s littoral regions.